The Red Arrows have embarked on the team’s biggest overseas tour in a decade. Last September 29 the Royal Air Force Aerobatic Team left RAF Scampton AFB towards the Asia-Pacific and Middle East regions where will perform more than 20 displays and a series of flypasts. The deployment will contribute to the UK government’s great campaign and showcase the best of British innovation and industry. In according to tour schedule from November 1st to 6th the team will perform at the China International Airshow in Zhuahai. Sqn Ldr Montenegro said: “The tour is a tangible demonstration of how the UK is a bold, outward-looking nation that works on the world stage with international partners. Indeed, our colourful, dynamic aerial display of precision, formation aerobatics – together with the associated events on the ground – are a vivid showcase of British engineering, teamwork and creativity”. To date the team has displayed to millions of people in 57 countries around the world since 1965. These pilots hope their performance will generate more interests toward aerospace and aviation among young Chinese. While they are in China they will visit schools and universities, hoping to inspire the next generation of pilots and engineers. The Red Arrows will perform nine displays at the six-day airshow in Zhuhai along with chinese display team August 1st and the Russian Knights and Swifts. Event are expected thousands of people. 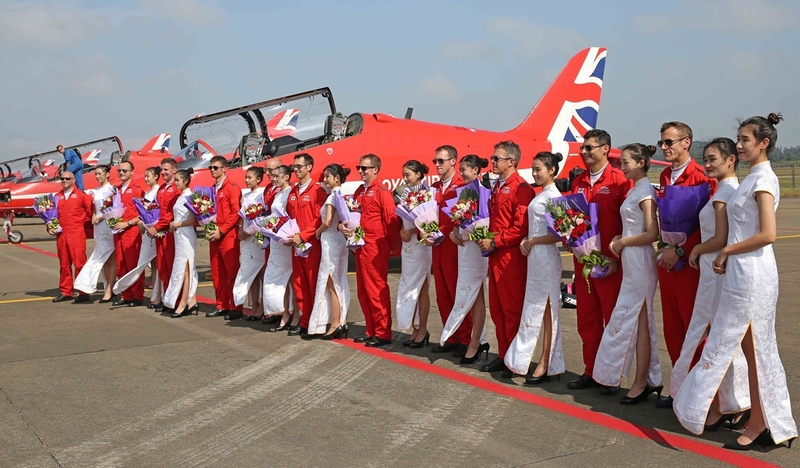 After China Airshow the red arrows will perform in other countries such as Thailand, Oman, Bahrain, UAE and Kuwait.